Do you ever notice a brand every time you visit your local store but never thought to try it? That's me when it comes to Palmer's Coconut Oil Formula. Every time I would wander through the body care sections at Wal-mart, I'd see this brand (I'd even pick up and read one of their products once or twice) but I've never tried anything from them. It's just one of those brands you've known about for years, but haven't summed up the courage to try something from just yet. And that brings me to a point I always make: Blogging is a beautiful thing. Aside from all that good stuff that I'm sure you've heard from every other blogger in the 'sphere, one of the very best things about blogging is getting the opportunity to discover new brands (or, in this case, old) and their products. When it comes to my face, my skin is neither dry or oily - I'd very much consider it normal. But if we're taking about my body, I'd classify that as dry as the Sahara Desert. And that is especially true when Winter rolls around. I am the absolute worst (and laziest) when it comes to moisturizing my body. To be completely honest, the only time you'd catch me throwing any type of hydrating product on my skin is during the summertime when I have to show some skin.. and it'll probably be only limited to just my legs. I'm horrible. Anywho, upon receiving these products, I made it my goal to start taking better care of the rest of my skin. Before we dive into my thoughts of each products, let me start off by saying that each product in this line have 4 main ingredients: raw coconut oil, tahitian monoi, sweet almond oil, and vitamin e. They're free from any harsh chemicals and are made with only the finest skin-healthy ingredients. Now let's get into the reviews..
Palmer's Coconut Oil Formula Body Lotion* | Along with the four main ingredients that I mentioned earlier, this one also has coconut milk in it's line up. I love the way this one glides onto the skin so easily and how my dehydrated skin soaks it right up. This one is my go-to product out of the three because it's more ideal for daily use compared to the other two, in my opinion. The only thing I would add to make this product perfect is a pump. I'm sure it would motivate even the laziest people (aka me) to slap some on their skin more often. Palmer's Coconut Oil Formula Body Cream* | This cream is a lot more thicker compared to the body lotion. It comes in a tub, which admittedly isn't my favourite, but I don't mind too much. I like to use this when my skin needs an extra boost of moisture. Whenever I throw this on, my skin looks and feels super hydrated. I especially like using this after I shave and exfoliate my legs - they look a billion times better. Added to the main ingredients is a blend of natural butters including Mango, Shea, Macadamia, and Cocoa. If you have extremely dry skin, I definitely recommend giving this one a try. 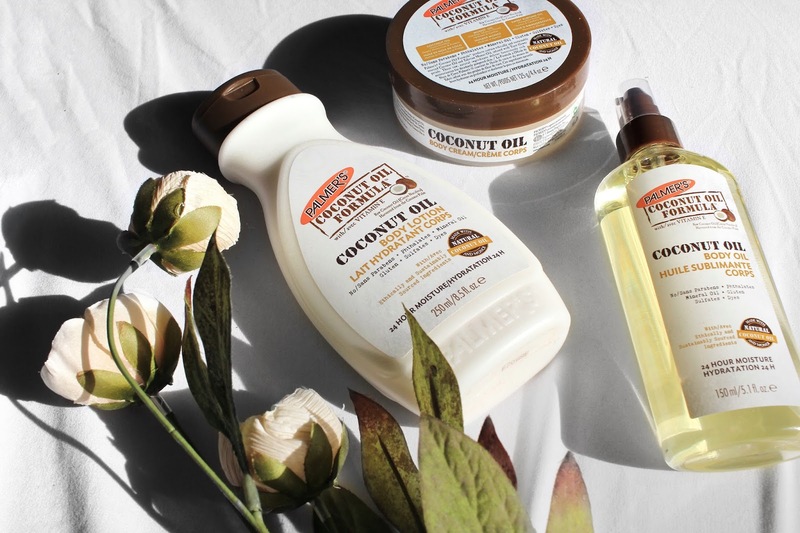 Palmer's Coconut Oil Formula Body Oil* | Though I love each product, this one I don't use as often only because I don't feel too comfortable throwing an oil on as moisturizer. I guess I'm just not used to it. Instead, I like to use this as a massage oil. And when I say massage oil, I mostly mean forcing my boyfriend to give me half-assed back rubs. Nonetheless, this hydrates my skin just as well as the body lotion, if not better. The body oil also has grape seed, macadamia and argan oil in it to work alongside the 4 special ingredients. One thing I really like about the body oil is the glow that it gives my skin. If I continue using this regularly, I'm pretty sure I'll be comfortable enough to slap this on throughout my whole body during the summer to give me that radiant, healthy looking shine. And now.. time for a little giveaway! I've partnered up with the brand to giveaway 3 prize packs containing the same three products mentioned in this post! The giveaway is open to Canadian residents only. Must be 18 years old or over OR must ask permission from a guardian before entering. Upon giveaway deadline, I'll be selecting 3 random winners - winners will be contacted and asked for their address in order for prizes to be shipped out to them; winners have 24hrs to respond before prize is forfeited and another name is drawn. Good luck! !